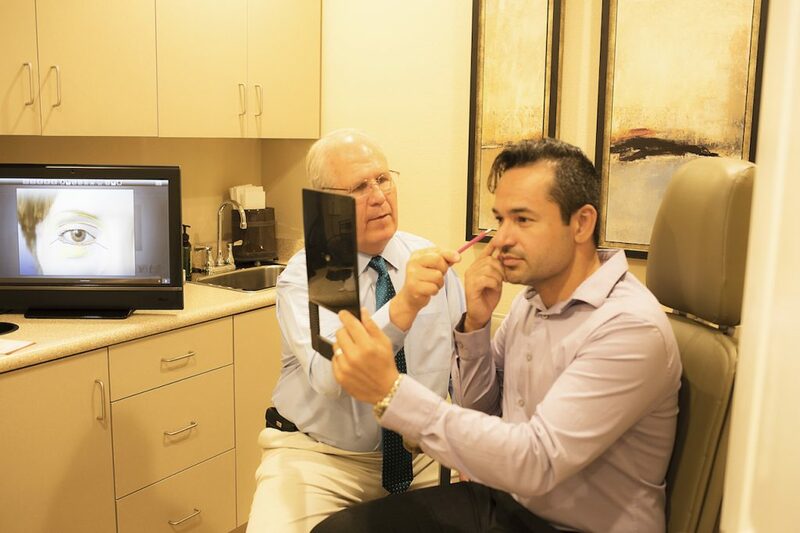 It’s more and more common to see men come in for plastic surgery treatments. Whether it is a surgery to help you feel more comfortable in a competitive job or laser hair removal to keep that unwanted hair gone, Dr. Kjar and Candessa Aesthetics have a wide variety to help you be a better version of you. Working out in the gym can be great for parts of your body, but there are some areas that exercise just can’t tone or improve. Instead of trying to hide those areas, imagine wanting to show them off. That’s where Charlotte Plastic Surgery can help. When exercise and diet can’t reduce or change an enlarged male breast area, gynecomastia may be the problem. This condition is usually caused by increased hormone levels, and surgery is required to remove the breast tissue. This procedure is performed with limited incisions to restore a balanced, well-formed chest and improve your self-esteem. Your face can make you look older or more fatigued than you really are, whether it’s drooping eyelids or sagging skin around the neck. For every part of your face that could use enhancing, there’s an option to help you look younger and more energized. Reduce the harmful effects of the sun and give your skin a more youthful appearance with laser treatments that help erase brown spots and lines with minimal recovery time. Dr. Kjar uses several different techniques and lasers to tailor the treatment to your skin type. Sun and many other factors such as dry skin, stress and everyday wear and tear can cause your skin to age prematurely, but there are ways to reverse that damage and prevent more damage from occurring.